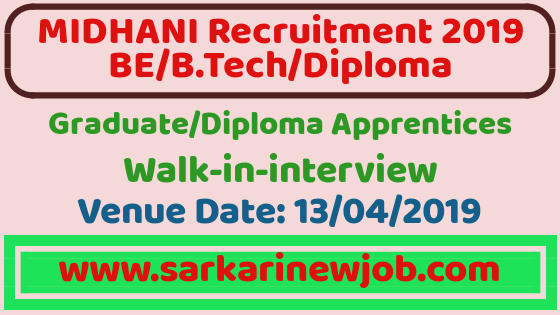 MIDHANI Walk-in-Interview 2019 for Graduate/Diploma Apprentices | 60 Posts | Venue Date-13 April 2019 - Sarkarinewjob.com A ultimate job portal to provide employment news. MIDHANI Recruitment 2019: Mishra Dhatu Nigam Ltd (MIDHANI) Job notification for the post of Graduate/Diploma Apprentices in various disciplines. The detailed eligibility and application process are given below. Note: The candidate should not have undergone apprenticeship training elsewhere or currently undergoing Apprenticeship training as per the Apprenticeship Training Act 1961. Period of Engagement: On contract basis for 1 year. · The selection will be subject to the interview followed by verification of the certificates (As per scheduled) of the shortlisted candidate and also they should be medically fit. How to apply MIDHANI Recruitment for Apprentice? All interested and eligible candidates can apply for this position in online by the following link and attend walk-in-interview at the following venue on 13 April 2019.